Wash and deseed the red peppers and then cut into slices. Cut the slices into halves or thirds. 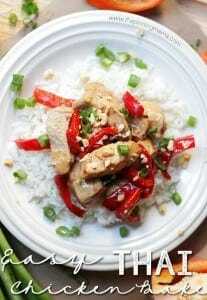 Make the sauce by combining the teriyaki sauce, rice wine vinegar, and red pepper flakes. Mix the chicken, peppers and sauce together until everything is evenly coated and then pour into a glass baking dish. Bake at 400?F for 10 minutes, stir and bake for 10-15 more minutes or until the chicken is cooked through. While the chicken bakes, cook the Success® Jasmine Rice as directed on the package. Serve by placing cooked chicken and sauce on a bed of Success® Jasmine Rice and garnishing with scallions and peanuts.